Smoked by Wretched Baselines or Panic is in the Eye of the Beholder! I haven't devoted an article to dbstealey before. He's arguably the biggest fanboi of Anthony Watts. He is guard dog, moderator, flamer and scientific illiteratum extraordinaire. Here is a comment which is rare, because in it he doesn't ad hom anyone. In fact he praises another person who made a comment. July 14, 2013 at 3:26 am Nik, I love that chart! 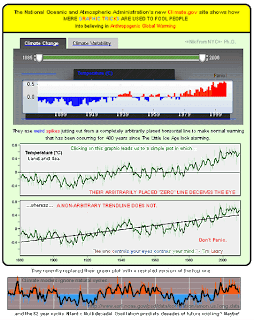 It clearly shows that when a non-zero baseline chart is used, the long term rising temperature trend shows no acceleration, despite the 40% rise in CO2. 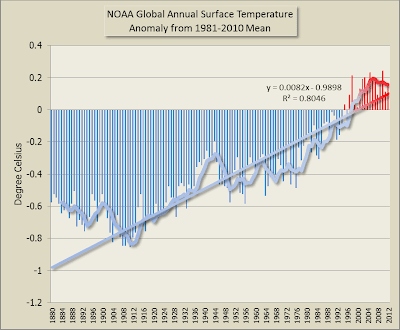 A zero baseline chart, OTOH, falsely shows accelerating temperatures. Your trend chart corrects that misconception. The chart he loves is shown below. Click to enlarge it. I'm guessing, but what I think Smokey is saying is the chart second from the bottom with the words "Don't Panic" written on it appears to him to correct a false impression that warming is accelerating. That chart itself is identical to the one immediately above it in every respect bar one. Despite what Smokey says, both have a zero baseline. It's set at the twentieth century mean. Both show identical data. The only differences are that there is a linear trend line drawn on the bottom chart and the base line is shown by a horizontal line on the upper charts; plus they have instructions written on them - one warns the reader that one "deceives the eye" while another tells the reader "Don't Panic". As for acceleration, where the chart rises from below to above the trendline it suggests the temperature is rising faster than the long term trend. It's the slope that indicates how fast the temperature is rising. Where the slope is steeper the rise is more rapid. 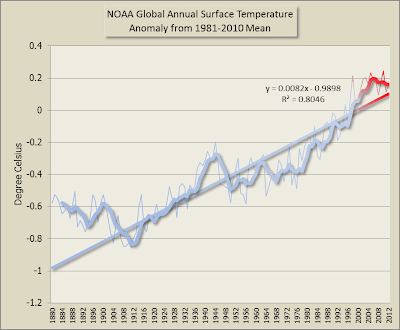 Since Smokey likes charts, I've put together some other charts of the same data (NCDC/NOAA) for him to ponder. Click any to see the larger versions. This first one is the "no need to panic" chart. There's only a little bit of warming right up the top and Smokey will find it harder to see the zero baseline. I should add that the linear trend line in all of them is not from the beginning (1880), it's from cold 1911 to the present. Not that that should make any difference to Smokey, who will undoubtedly think that all the charts are very different from each other! All this goes to show that science deniers are a weird mob. 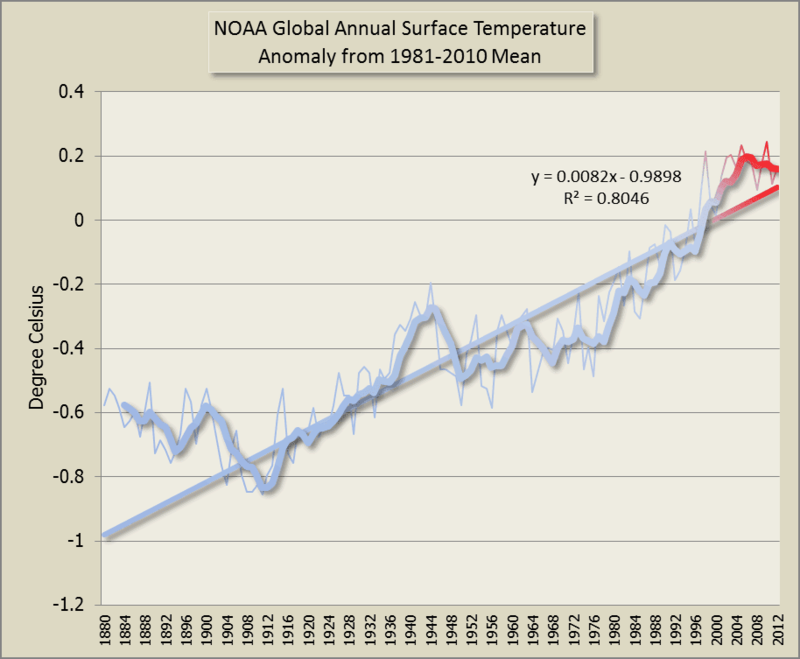 You'd have thought that in the years spent denying climate science, Smokey (and Anthony Watts) would have learnt how to read a temperature chart and what an anomaly from a baseline means. But no! 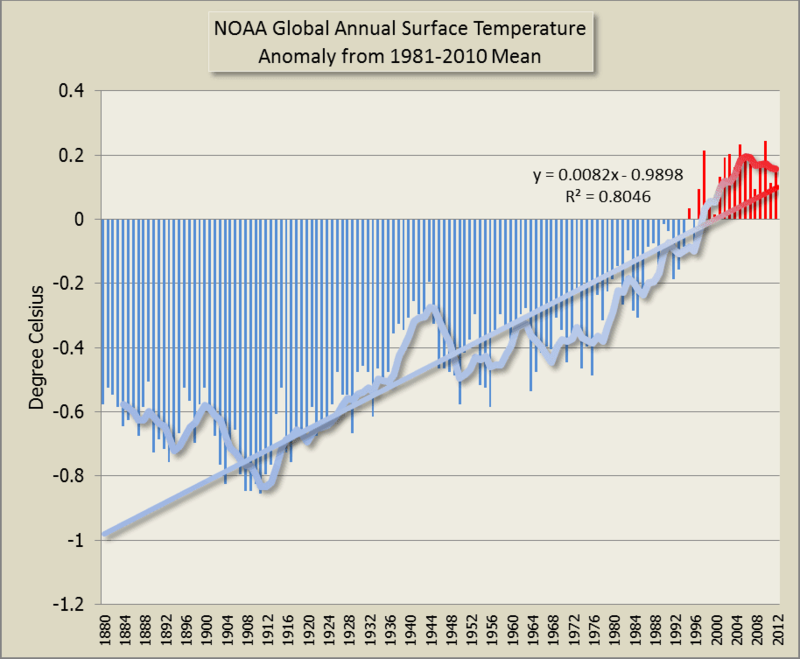 I notice that in the same comment, he links to Archibald's silly "Greenhouse effect 20 ppm increment" chart. There's been some recent kerfuffle about leaving information out of graphs. Perhaps the information too often left out of GAT reconstructions is estimated forcing. Perhaps if the Watties could see more relevant information, they would... No, I'm being silly now. I like how Nik is trying to reframe the "cherry pick" as "non arbitrary". Whilst not being smart or subtle in any way, it is still smarter and more subtle than I expect from "Skeptics". 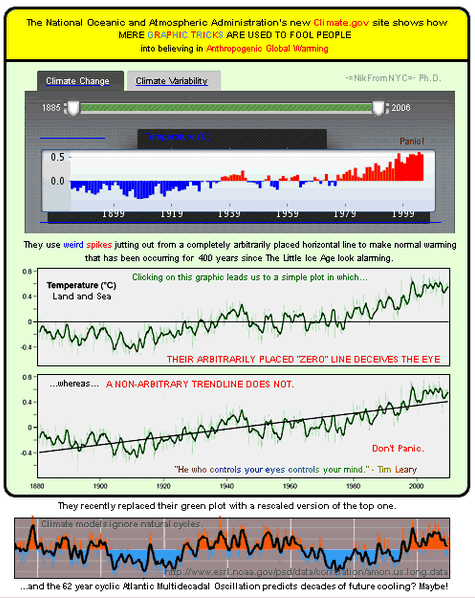 Smokey has this odd notion that because the trend for the entire series is 0.66°C per century then the trend for any period within the series must also be 0.66°C per century and, therefore, the observed near doubling in the centennial rate of warming hasn't occurred. I suspect this is because Nik's non arbitrary/cherry picked trend line has deceived his eye.